BEIJING - Raising a young child on your own while going to school is hard enough for anyone. It's particularly challenging when that person is also a child herself. Yet that was the task facing He Ling, who was only 11 years old when she was left to care for her young sister. "I'd lost my parents and my grandmother, left alone in the world with my 5-year-old baby sister. I decided to raise her all by myself," He said. Born in 1988 into a poor family in Wanzhou, Chongqing municipality, He lost her father at the age of seven to an accident when he was working as a migrant worker in Zhejiang province. Her mother returned home with He's baby sister and died of depression two years later. Her grandmother then gave the two young girls shelter and started to teach them to do things such as taking care of household chores and working in the field. But two years later, the grandma also passed away. Since their uncles and aunts were too poor to raise the two orphans, they suggested putting the younger one up for adoption. But He opposed the idea. "She is all I have left and the only reason for my existence," recalled He, who had grown into a very strong-minded person. Since girls are traditionally not favored by families, especially in the poor rural countryside, she knew well what would happen to her younger sister if she was adopted. "People in the village are very practical," said He. "They might be willing to adopt my sister because she could soon grow into a helping hand. That would give her the chance to survive, but I didn't think she stood much chance to be treated well, not to mention to receive a proper education." The sisters lived on the prepared and dried food left by their grandmother, grew vegetables, collected wild herbs to sell to the local Chinese drug store, and about once a year got a subsidy from the local government. "When we fell short of food, relatives and neighbors gave us some meat and grains," said He. Most of the time, the two sisters relied on themselves. At that time, He was still in her last year in primary school, a one-hour walk from their home. She would board at the school and return home on weekends. Since her sister was too young to be of much help, even her uncles were unwilling to give her shelter at night, so she could only leave her sister alone at home at night while she was in school. She would prepare a week of meals in advance, and her sister would eat the food cold or heat it a little bit when hungry, while He took her own share to school. Things became easier the next year when He started high school and her sister entered primary school. In the daytime, her sister had teachers to care for her at school, while at night, her sister stayed at her uncle's home since she had grown old enough to offer a helping hand. Though she lived a simple life in high school, wearing old clothes from relatives or friends, she decided to give herself a treat for the university entrance exam by buying a pair of new clothes. "I just didn't want to look different," she said. The pair of new clothes made her look confident - and also gave her good luck on the exam, on which she scored high enough to enter Chongqing Technology and Business University. Now a 23-year-old senior student, He became a campus celebrity after her story became known. On May 18, He was given the spotlight in the university's auditorium as she was recognized as one of "the most moving figures" this year. Her sister is now a first year student in a senior high school near their hometown. Looking back on the past 12 years, He said she owes too much to her primary school teacher Pu Yunwan, who not only offered help with her tuition at school, but also encouraged her to continue studying rather than dropping out of school. "Teacher Pu was my savior, who changed my life and talked me out of feeling insecure and acting unsociably," she said. 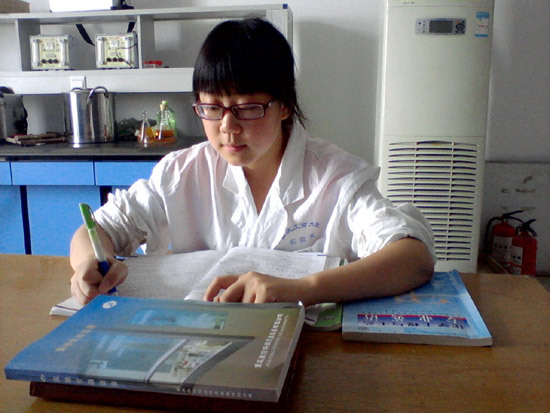 She hopes to become a teacher, like Teacher Pu, who is always willing to offer help to students in need.